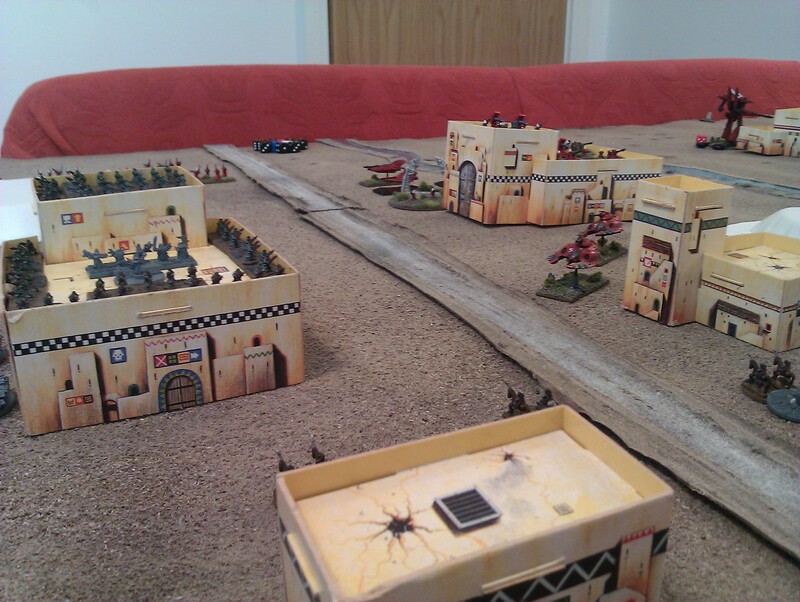 As I mentioned in the last blog post, I played a game of EPIC against Andy from Miniature Miscellany on Friday. 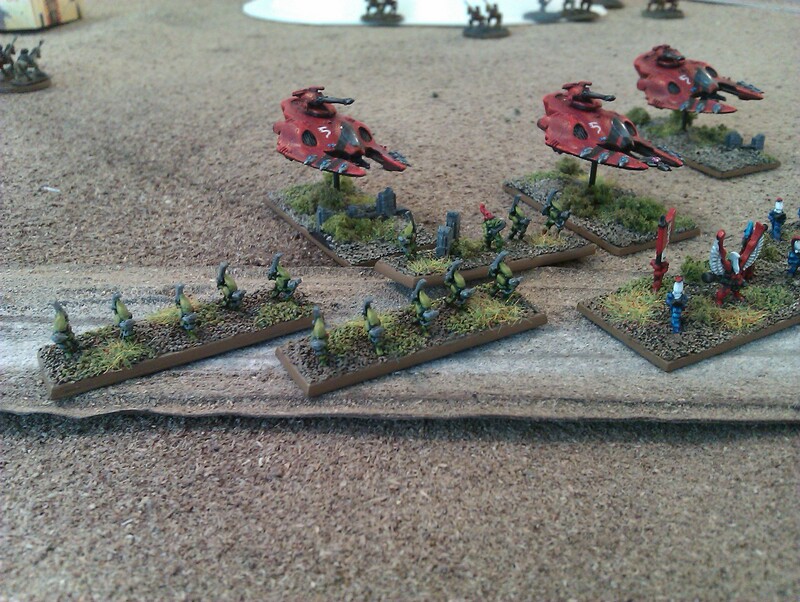 Andy has a truly beautiful Saim Hann themed army, full of jetbikes and falcons, all painted in a deep red scheme. Please go check them out, especially his Phantom Titan! The list I took is in the previous post while Andy’s list roughly contained a Phantom Titan, Aspect Warriors in Wave Serpents, 2 Guardian formations with Heavy / Support Weapons, 3 Falcon formations and 3 Windrider Hosts. There may be a few thing wrong with my memory, but I am sure that list is roughly right. 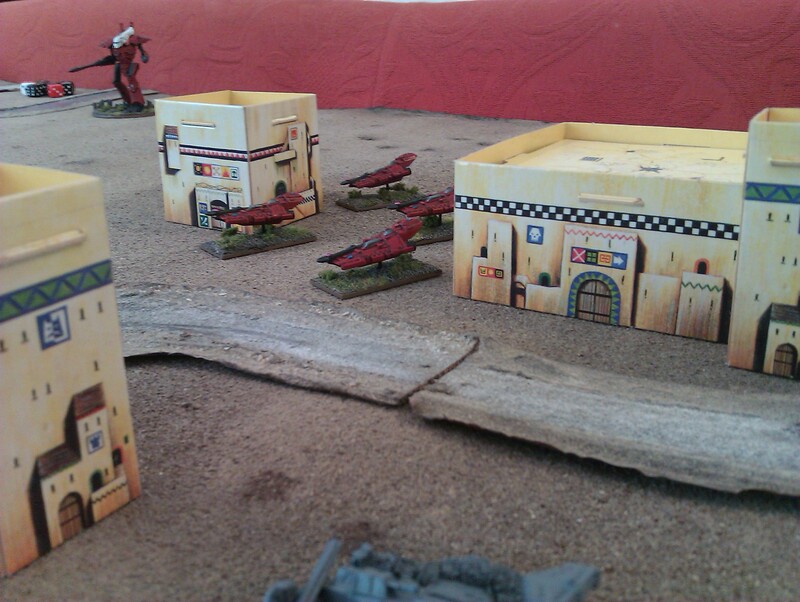 The board was relatively sparsely terrained, with a handful of largish Ork buildings scattered around. Normally my board is absolutely packed with urban terrain, so it was nice to play on an emptier board for a change. 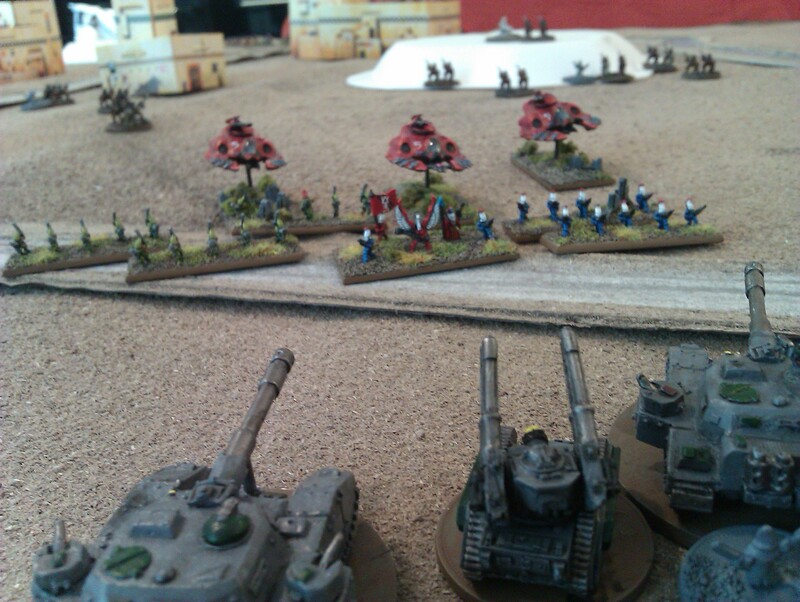 Once the game started I struggled to use my Baneblade company effectively, using them at too long a range to bring all of thier guns to bear while Andy skilfully avoided most of the fire my formations threw out. After garrisoning a few of the buildings with my Regimental Command and the Infantry Company with Griffons, a short range series of engagements / fire fights broke out with the Guardian and Windrider hosts streaming from the webway gate. It could only go one way! I think the turning point of the game was definitely when Andy managed to get an un-blastmarkered Aspect Host into assualt with my BTS, the Shadowsword Company. They Shadowswords had done pretty well up until that point, knocking 5 DC off the Phantom Titan with one salvo, but could not survive the Aspect Warriors. Two Shadowswords died in the engagement and the remaining one slunk off to try and hide. Unfortunately the Phantom Titan then shot it off the board, pretty much clinching my defeat. The game ended on turn 3, with Andy winning with 2 or 3 objectives to my zero. I would highly recommend anyone looking for very pretty Eldar minis (or very pretty anything else too!) to check out Miniature Miscellany. Other than that I have been working my way through the back posts of Jodrell Plays Games, and admiring his very nice Knights. Great photos, Gus. They came out very well. I particularly like the one of the Aspect Warriors facing off against the Shadowswords. Hopefully I’ll have my whole army painted up for the next time we play.